The video illustrates (using researchers taking the roles of children) the system developed by Joshua Wainer as part of his PhD research at University of Hertfordshire. In this study, KASPAR was developed to fully autonomously play games with pairs of children with autism. The robot provides encouragement, motivation and feedback, and 'joins in the game'. The system was evaluated in long-term studies with children with autism (J. Wainer et al. 2014). Results show that KASPAR encourages collaborative skills in children with autism. BigDog handles heavy objects. The goal is to use the strength of the legs and torso to help power motions of the arm. 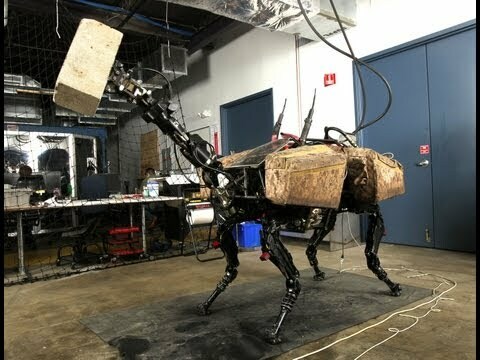 This sort of dynamic, whole-body approach to manipulation is used routinely by human athletes and will enhance the performance of advanced robots. 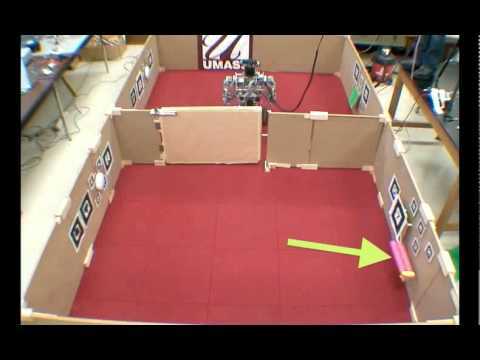 This video demonstrates the autonomous-skill acquisition of a robot acting in a constrained environment called the "Red Room". The environment consists of buttons, levers, and switches, all located at points of interest designated by ARTags. The robot can navigate to these locations and perform primitive manipulation actions, some of which affect the physical state of the maze (e.g., by opening or closing a door). The harmonic arm robot localizes the door handle by touching it. 3-DOF localization is performed in this video. Once the localization is complete, the robot is able to grasp and manipulate the handle. The mobile platform is teleoperated, whereas the robotic arm motions are autonomous. A 2-D model of the door and handle was constructed from hand measurements for this experiment.